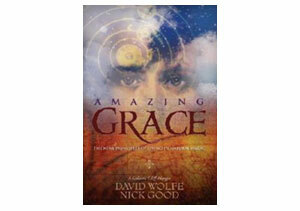 The Amazing Grace book, by authors David Wolfe and Nick Good, is a recent best seller in the Raw Food/Superfood world. A world that supports achieving the highest life possible at all costs! Fueled, of course, by the highest quality superfoods and longevity foods we can find today, this book promotes nutrition for the mindset of the superhero! The two authors have joined forces to bring to the forefront one of the most motivating success books ever! With boldness and creative passion these beings have invented, what I like to call, "the modern day superhero guide" for activating the "higher You." This book is fertile soil for the seed that is inside all of us! David Wolfe, also author of Superfoods: The Food and Medicine of the Future, knows why superfoods and the top 10 superfoods have immense value in creating a clear mind and the kind of ingredients needed for taking action in our life to manifest our truest potentials. Amazing Grace: The Nine Principles of Living in Natural Magic: A Galactic Cliff-Hanger is a book to be embraced by those seeking the best health possible, creating the means and resources to achieving life success that comes from finding the souls work without compromise! It highlights taking the chance on "change", following whims and reprogramming self destructive patterns and habits that are no longer serving us! "This is the moment you've all be waiting for. You are being called. You have spent your entire existence preparing for this incredible time. Inside you have always known that you possess something grand, something extraordinary. Upon reflection, the planetary crisis is really a crisis that is motivating you to tap this inner potential of your spirit-soul. The moment draws near. Step into your destiny. It is time to turn yourself on to Amazing Grace and The Nine Principle's Of Living In Natural Magic." The Amazing Grace book is a guide that inspires and evokes the next stage of evolution for the human species, should we choose to here the call. The authors share their secrets from personal life experiences to integrating the Hawaiian spiritual teachings of "Huna". The thoughts we think and the beliefs we have all begin to unravel as a life given mission of our ancestors. I highly recommend picking up this valuable book that will shift your world in "amazing" ways!